The other day I reached the last page in the journal I’ve been writing in and tracking my life with for the last two and a half years. After I closed the journal, leaving that final page blank for the moment, I felt a wave of discouragement and disappointment. How could I still be dealing with some of this? Why do I feel like I’ve made so little progress? Why is this taking longer to walk through than I originally hoped? A discouraging thought then popped up in my head: God, You must be pretty disappointed with me. Writing is how I process what’s going on in my life. The good stuff. The bad stuff. And everything in between. Everyone processes life differently, but it’s critical that we find an outlet – or a combination of different outlets – where we can express ourselves honestly and completely. We have to find a way to air out all of our junk and pour out our hearts before God and the people closest to us. For some of us, writing is that outlet. For others, it might be just talking it out. Maybe its artwork or music; exercising or building something. I’m a huge believer in journaling. As someone who is naturally prone to forgetfulness, it’s a great way to remind myself of that God is good and still faithful. God is. I can go back and remember all the answered prayers, all the times He walked me through a difficult situation, all the reminders to just trust in Him and find rest, peace and joy in Jesus and nothing else. My journals also a reminder that life is messy. It’s not always going to feel like I’m listening to “Walking on Sunshine” on repeat (although that gets old really quickly). Jesus said, “In this world you will have trouble. But take heart! I have overcome the world” (John 16:33, emphasis mine). There will be moments where you feel like you’re in over your head. But Jesus is bigger than all of it. It helps to write all that down once in a while. Going back to that discouraging thought I had when I reached the second to last page of my journal, that’s one of the false equivalencies I often make in my walk with God: If I’m upset or disappointed with myself, then God must be, too. But when I look at His word, nothing could be further from the truth. From scripture and my own journaling, I’m reminded that there is nothing that could separate me from His love; that His grace and mercy are never ends; and that there’s a clean slate every morning. 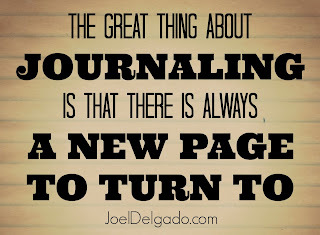 The great thing about journaling is that there is always a new page to turn to. That new page is always clear and empty and can be filled with the words we need to write. Sometimes those words are filled with pain and doubt and sadness, other times they are filled with joy and faith and hope. But as long as those words are authentic, as long those words come from right where we are, then those are the words God wants to hear. 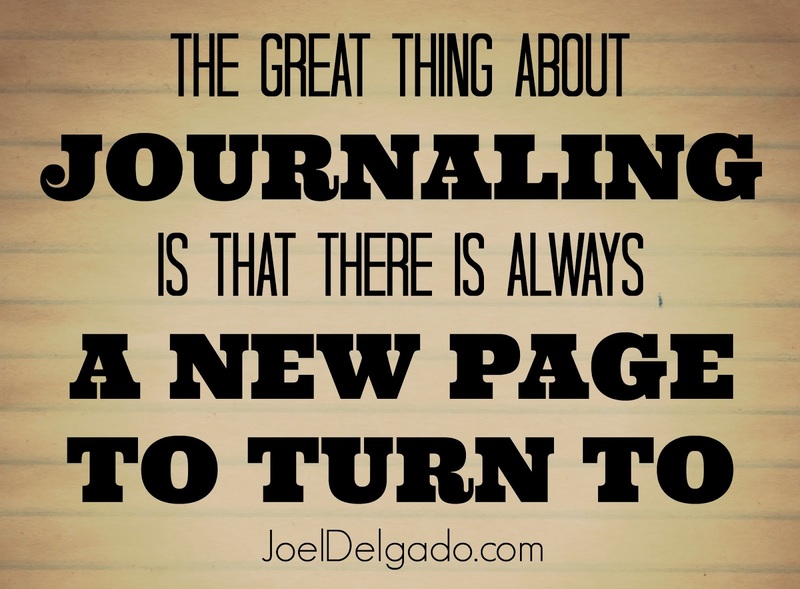 That’s the key to great journaling and great writing: authenticity. God doesn’t want us to put up a front. He wants us to come as we are and to pour out what’s in our hearts so that He can fill them up with something better. When we do that, we partner with God as He writes and guides our story. There will be times when we feel like we’re making progress and things are moving quicker than Michael Phelps swimming the 200-meter freestyle. And then there are moments when we’ll feel like we’re stuck in the mud and struggling to crawl two inches forward. Our struggles are all unique. Some might take days or weeks to conquer while others may take months and years. But all of our struggles serve the same purpose: they are opportunities to refine us and mold us into the men and women we were made to be. Whether you’re at the finish line or stuck in that mud somewhere near the halfway mark, God is still there with you. And He still loves you. As I stared at that last page in my journal, I wanted to write something there that would help me chart a new course. I wrote it big and bold on that last page. That was how I wanted to close this chapter of my story and how I wanted to start the next one. Every time I go back to that journal, with all the bumps and bruises and joys in it, I want to go back to that last page and remember that it ended well. I want that last page to set the tone for the next page. Who am I going to look to? Whose face am I going to seek? Let it be Jesus. Always Jesus. Your post was worth a read,We are so busy in our daily routine that we really don't stop for a second and think about these things!Your blog post was really eye-opening.Glad that you wrote on this topic!